How to send PDF automatically after conversion from files? This article will show you a way about how to convert files to PDF and send the converted PDF file to someone automatically after conversion. 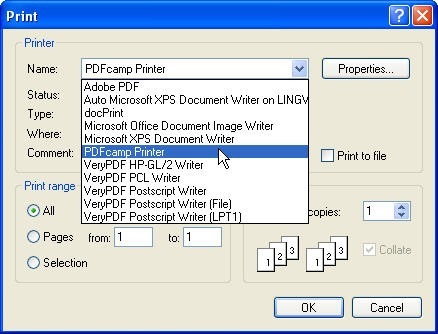 PDFcamp Printer can help you convert all the any printable document to PDF and allows you to send PDF automatically after conversion. Here is the link for you to have a free trail, http://www.verypdf.com/pdfcamp/pdfcamp_setup.exe. If you need to know more about it, please visit its homepage. After installation, this software will be shown in the Printers and Faxes list. Step 2. Add email address. Printer and Fax can be found by clicking the button Start. Find PDFcamp 2.3 and go to its properties menu. The following snap shot is the interface of properties menu. Please go to Advance tab then go to option Printing Defaults. When you enter Printing Defaults, please do as the following snapshot. Go to Email tab and set the SMTP Server Authentication. Click Setting button then you can go to SMTP Server Authentication. Step 3. Print file to PDF. 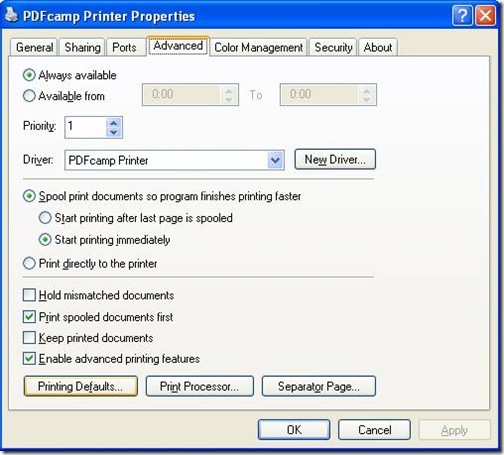 PDFcamp Printer can print all printable file to PDF file. 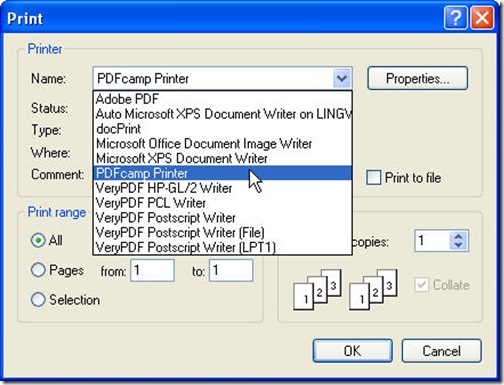 No matter which file format do you need to print, just open it and choose print and set the virtual printer as PDFcamp Printer, all the conversion and sending jobs will be processed automatically. Take converting html to PDF file for example. 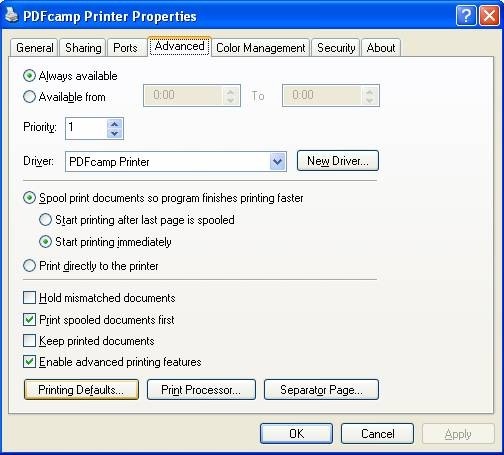 Just open html file by any browser, click File on the left top corner of the browser then go to option Print and choose PDFcamp Printer as the default printer, hoping the following snap useful for you. After setting your options on this menu list then click button OK, the conversion will be processed automatically. At last, you will be reminded to choose how and where to save the converted PDF file. Meanwhile, the converted PDF file will be sent to email address according to the account name you have set in the last step. Here I will call an end for this article. If you have any question about how to convert files to PDF and send PDF automatically by email, you can contact us by any way provided on this website. How to print PDF file to Canon Printer 11×17 size paper? How to print Photoshop PSD file to PDF file? How can I print a PCX image to PDF file? 2 Responses to How to send PDF automatically after conversion from files? Any option to fetch values reading a config file? We have multiple send addresses and destination addresses.